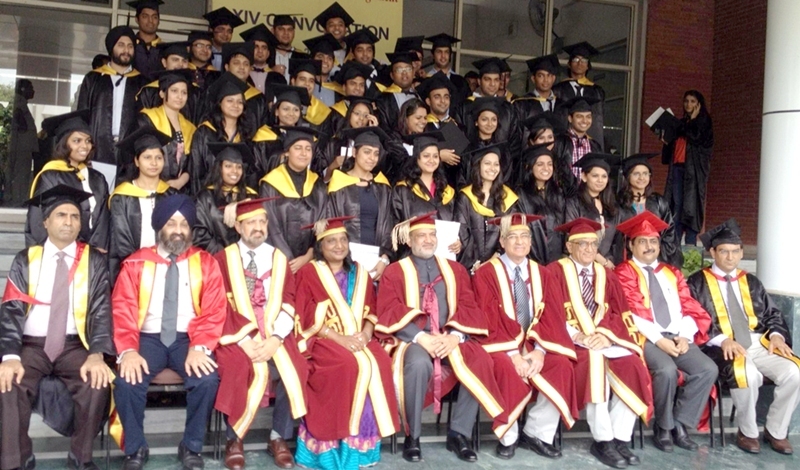 Apeejay School of Management, New Delhi, one of the premier B-Schools in the country today organized its 14th convocation ceremony for the outgoing batch of 2010-2012 with diploma in Management at their Dwarka Campus. Altogether 142 numbers of students were presented diplomas during the ceremony. 7 students received medals for overall outstanding performance. Dr Adarsh Kishore, Chairman, Axis Bank Ltd was the chief guest for the occasion. Mrs. Sushma Berlia, President, Apeejay Education Society also graced the occasion. The event commenced with a Convocation Procession and the declaration of the Convocation Ceremony by Mrs. Sushma Berlia, President, Apeejay Education Society. It was followed by a report from the Director of Apeejay School of Management, Dr. Alok Saklani. While delivering the convocation address, Chief Guest for the occasion, Dr Adarsh Kishore, Chairman, Axis Bank Ltd, said, “He was happy to be here and congralauted the students, and talks about the new vision of country and he also mentioned about that by 2020 India will be 3rd largest country in terms of power priority”. Speaking on the occasion, Mrs. Sushma Berlia, President, Apeejay Education Society, said “she was delighted to be here and welcome Dr Adarsh Kishore. She played tribute to Dr.Stya Paul and talks about his dream to establish a seat of global learning that would bring about transformation of society through value-based education, man-making and nation-building. This award will further encourage us in our endeavour to deliver quality education in sync with India’s emergence as a knowledge superpower. She also said that we are living in a challenging and interesting time and also share the four mantras. Innovate personally, hard work, values of life and Excellence”. Madam President presented a memento to Dr Adarsh Kishore and Prof. Alok Saklani presented a memento to Madam President. The convocation ceremony was attended by a galaxy of scholars, members of the Governing Body and Academic Council, graduating students and their parents. At last the event ended up with the declaration of the closing of the Convocation by Mrs. Sushma Berlia followed by national anthem.